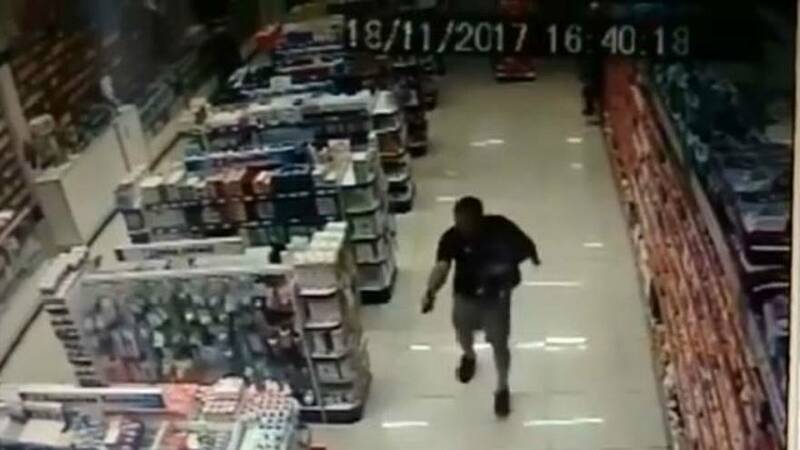 An off-duty policeman in Brazil was hailed a hero by Brazilian media after he shot a robber while holding his infant son in one arm last Saturday (November 18). CCTV footage released by São Paulo’s State Police shows how Sgt Rafael Souza fired at a man while holding his son. He’s seen passing his son to his wife after firing his gun. The Brazilian news website Estadão said Souza killed the two men who were trying to rob a pharmacy in the city of Campo Limpo Paulista in the state of São Paulo. Souza and his family were in the pharmacy when two hooded men entered the establishment and announced the robbery. According to witnesses on the scene, one of the robbers pointed the gun at Souza, at which point the off-duty cop responded.